Antique Collection 7" White w/ Antique Scrolled Trim Salad/Dessert Plastic Plates, 20ct. Home»China-like Tableware»Antique Collection - White and Clear»Antique Collection - White»Antique Collection 7" White w/ Antique Scrolled Trim Salad/Dessert Plastic Plates, 20ct. China like, premium quality heavyweight plastic plates. 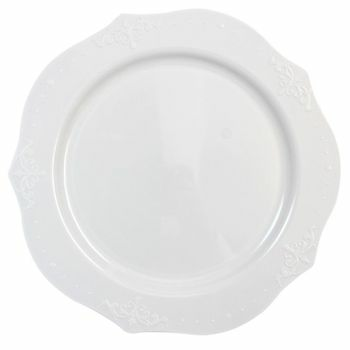 Antique White colored plate with elegant designed border. Quit the hassle of washing dishes go green go Disposable. Great for weddings, Receptions, Birthday parties, Baby showers, holiday and family gathering, or any Catered special event. Antique Collection 10" White w/ Antique Scrolled Trim Dinner Plastic Plates, 20ct. Antique Collection 9" White w/ Antique Scrolled Trim Luncheon Plastic Plates, 20ct. Antique Collection White w/ Antique Scrolled Trim Soup Bowls, 20ct. Antique Collection White w/ Antique Scrolled Trim Oval Bowls, 20ct.